I think initially I was stymied by my assumption that DnG were saying any point of a rhizome can be directly and simultaneously connected to any other point without any intervening or intermediary points. My mechanistic view of physical reality balked at this, or in DnG's terms, I was trapped in arborescent thinking. In aborescent, or hierarchical, structures, each node occupies a fixed point in the overall structure and connects directly only to those nodes immediately above and below it. Its relation to all other nodes in the structure are mediated, and thus controlled, by the nodes through which it must pass in order to connect and communicate to those remote nodes. Moreover, two points cannot occupy the same space. Arborescent thinking has a very strict economy: one point, one space. A point can occupy only one space, and no two points can occupy the same space—a place for everything, and everything in its place. Any point is responsible for the points below it and responsible to the point above it. Arborescent thinking, then, creates a rigidly delineated arrangement of any thing, physical or mental. Rhizome thinking is different, though it can incorporate arborescent thinking (Arborescent thinking does not include rhizomes, however). In a rhizome way of thinking, no given point is fixed in any given place. Rather, a point is a nexus of potential places, properties, trajectories, and speeds, a swelter of probabilities that emerge and shift as the point interacts with the field of other points. Moreover, all those points are exerting some influence, some connection, however small, on every other point in the field, all at the same time. And the field is ultimately very large: the entire Universe. Everything is, in fact, connected to every other thing. Everything, then, is a shimmering potential of probability that emerges into our consciousness for an instant and then arcs on to some other expression. Nothing is static, nothing stays in its place. No place for anything, and nothing in its place. This connection of any one point to all other points is easy to see in digital information, where any piece of data can easily be connected to any other piece of data. For instance, at Amazon readers are constantly applying new tags to books. Indeed, any book in Amazon can have as many tags, identifiers, as people wish to give it. Thus, Deleuze and Guattari's A Thousand Plateaus need no longer be filed in a hierarchical taxonomy under French philosophy, but can be filed as well under modern psychology, poststructuralism, friends of Michael Foucault, stuttering, and weed management. DnG can be connected to most any idea that any reader, however deranged or sane, can imagine. 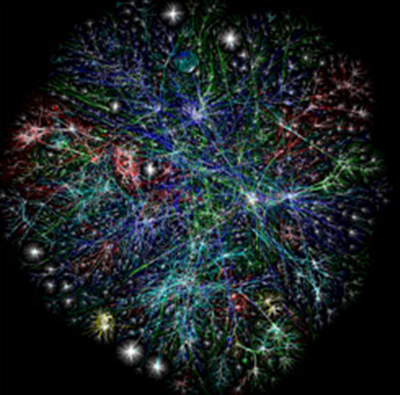 Connectivity – the capacity to aggregate by making connections at any point on and within itself. Decalcomania – forming through continuous negotiation with its context, constantly adapting by experimentation, thus performing a non-symmetrical active resistance against rigid organization and restriction. One of the first features of a rhizome that we find quite odd is that all nodes in the rhizome are in fact connected to all other nodes. As Koh puts it: "in a rhizomatic system each point can and must have connections to all others, unconstrained by any bifurcating order." Unlike hierarchical systems which assign a rank and file to each node, thus constraining relationships among them, rhizome structures do not constrain the relationships among any nodes. All nodes are related to all other nodes. My good friend Dan Jaeckle introduced me to the concept of the rhizome as first expressed by Gilles Deleuze and Felix Guattari in their 1987 book A Thousand Plateaus, the second volume of their two volume work Civilization and Schizophrenia. I do not presume to be a scholar of French philosophy, nor do I presume to understand Deleuze and Guattari very well; however, the rhizome has captured my imagination as a marvelous description of the structures that I have been calling networks. I have been writing about networks for the past two years, and basically, I have been contrasting them to hierarchies. The gist of my argument has been that, in response to modern technology in general and information technology in particular, humankind is undergoing a shift from hierarchy as the dominant mode for structuring human reality to networks as the dominant mode. This shift is as deep and as extensive a shift as humankind has ever undergone, and it will change everything. However, I have for sometime felt an uneasiness with trying to say all that I wanted to say about this new structure with the term network. I've not been systematic enough in my thinking to say what my uneasiness was all about, other than that network didn't seem to capture just what I meant. Rhizome may be the concept I'm looking for. Whether it captures it all or not, I cannot yet say, but I'm already convinced that it will expand and sharpen my ability to speak about the structures that are coming to dominate the way people think, communicate, and organize their affairs. I have already corrected one error in my thinking: rhizomes (or networks) are not the opposite of hierarchies, or as Chuen-Ferng Koh says in Internet: Towards a Holistic Ontology, "It is important not to see the rhizome in binary opposition to the tree … The concept of the rhizome was set up precisely to challenge dichotomous branching." Rhizomes are inclusive of hierarchies. Hierarchies, however, do not include rhizomes, at least not formally. I think it certain that rhizomes have existed in the most rigid of hierarchical structures throughout history, but on a clandestine, ad hoc, submerged basis that is almost never recognized by the power structure of the hierarchy and never sanctioned. Indeed, one of the formal characteristics of hierarchies is that they are exclusive of all that is not within the hierarchy, and they invest great resources in marking the boundaries between the organization and the rest of the world. Hierarchies are always mindful of managing their entry and exit procedures, and they tend to make the barriers to entry and exit rather high. Rhizomes are not opposite to hierarchies so much as they simply ignore hierarchies, cutting in arcs across hierarchical boundaries and levels, connecting nodes at various levels within the hierarchy to each other and to nodes totally outside the hierarchy. Hierarchies find such connections and collaborations highly disruptive and treasonous. Rhizomes are indifferent to entry and exit barriers. Whoever will can enter the rhizome, and whoever won't can exit. In either case, the rhizome is largely unaffected. Its formal characteristics persist.